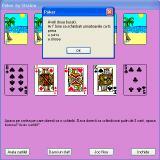 Poker A program to simulate a poker game (without bets). It can give the user advice about the cards to change and can explain the result of the game. It’s an ideal software to explain the rules of the game to beginners.